I began by creating a simple page. You can see the script tag pointing to my behance script. I needed a way to specify a user so in this case I went with a global variable. It’s possible to pass in variables via the query string, but this causes problems if you use async/deferred script tags. Now let’s look at the actual script. This may be a bit complex so let me break it down for you. Start at line 43 (notice - I know the Gist displays are a bit broken lately, sorry). I check for the global variable and if it doesn’t exist, I exit immediately. Otherwise, I use JSON/P to open a connection to Google’s Feed API. This lets me bypass cross-domain security issues as well as turn the RSS feed at Behance into a much simpler JSON structure. One little nit here. Notice that I have to specify a callback function. All of the code on this page is meant to be self-contained. I don’t want to leak out into the global variable scope and blow away any code you may have written yourself. But for the callback to work it needed to be visible globally. So to get around that, I create a randomly named function. You can see that logic in lines 5 to 11. Outside of that - the code is relatively simple. Take those results. Draw it into the DOM. And that’s it. The CSS portion is a bit messy. You can see it as one ginormous string in line 57. That’s probably something I could do better. I’ve got one little CSS issue I’d love some help with. 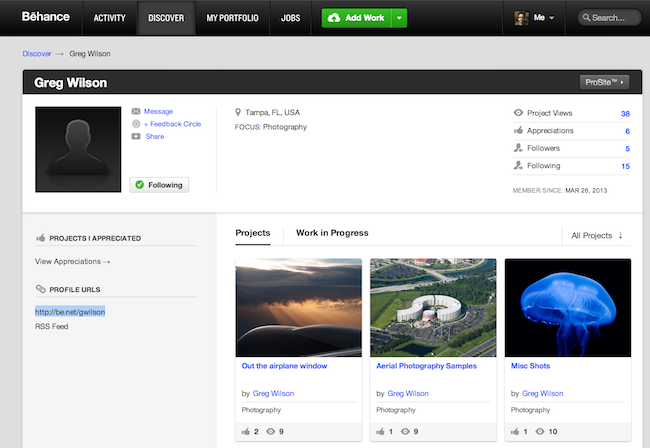 The last thing I did was add the Behance logo to the top header. This pushed over the name a bit. If anyone has a fix for that, I’d appreciate it. If anyone makes use of this code, please let me know. How long ago was 1973?